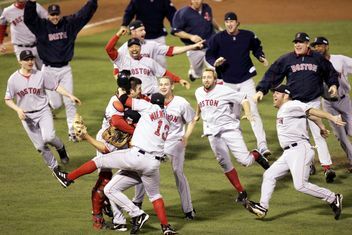 The 2004 World Series was Major League Baseball’s (MLB) championship series for the 2004 season. It was the 100th World Series and featured the American League (AL) champions, the Boston Red Sox, against the National League (NL) champions, the St. Louis Cardinals. The Red Sox defeated the Cardinals four games to none in the best-of-seven series, played at Fenway Park and Busch Memorial Stadium. The series was played between October 23 and 27, 2004, broadcast on Fox, and watched by an average of just under 25.5 million viewers.